The Creditz Digital Currency System is a new alternative currency that transforms reward points, frequent flyer miles, loyalty points and other non-cash currencies into a digital currency, which will be used the same as cash at participating national retailers, merchants, vendors and manufacturers. Consumers will earn Creditz currency when they buy products wherever the logo is displayed. Thus Creditz digital currency is a new form of customer reward, but it will always be in digital form and cannot be withdrawn. Once earned it can be spent the same as cash: one Creditz = 1 cent. The company’s partners and alliances include IBM, Merrill Lynch, First Data, Verifone, and Scrip Advantage. The master licensee for the U.S. of the Creditz system is CEO America Inc.. For more information go to www.creditz.com. Editor’s note: Interestingly, the subject of a “reward currency” for members of a trade exchange was a major topic at the most recent IRTA convention, just concluded. The first 25 years of the International Reciprocal Trade Association’s existence saw an internal focus. This year, the commercial barter industry removed the blinders with an expanded look at the growing world of cashless trading, at IRTA’s 26 Annual Convention held September 22-25 at the Wyndham Palace Resort & Spa in Disney World. Lietaer’s message to the attendees was energizing and factual. He provided a 5-year outlook for today’s current financial situation, though many in the audience were stunned by precise information and suggestions of currency upheavals ahead. Yet it was obvious that Lietaer feels barter, especially if the industry can undergo considerable growth, could provide a substantially stabilizing role for what’s expected to be a growing unemployment situation worldwide. According to the monetary expert, businesses, individuals and entire communities, would be better off when barter becomes an integral component with growing usage. Lietaer’s message was especially relevant because the commercial barter industry has never fully comprehended or understood (or even cared about in many cases) what community currencies represented. Although his message to the attendees asserted that the future of money will be complementary currencies, he also was quick to point out that this did not mean that the existing national currencies would be compromised. What’s ahead for the commercial barter industry? He contends that it’s really up to a handful of visionaries who are willing to move forward a step at a time, conveying that those within the industry must realize that the first important step is selective standardization for internet barter transactions. He emphasized that this must be done by the industry to get to a higher level, pointing out that the banking industry only became “important” because of standardization. His message was straight forward. Standards include: say what you do, do what you say, and prove it—with written records and results. The barter industry can, Swann said, immediately implement steps that would require little money, but would raise the level of performance within the industry. Will the industry take action on standardization? Historically, after a well-meaning convention is concluded, attendees “go back to business” and little action on what was talked about actually occurs. Special Recognition was given to Universal Currency Broker Jennifer Ashworth and IRTA’s Executive Director Krista Vardabash. In last week’s report we covered his extensive achievements. Not mentioned, however were Federowsky’s efforts and input in developing Bartercard’s online transactional web site (including auction, e-marketplace, and shopping mall) which recently saw the $100,000,000th online dollar traded. 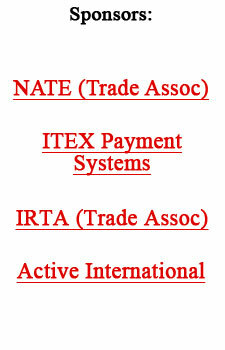 The IRTA convention’s major Platinum Sponsor was Turk Barter. Active International and Florida Barter were major sponsors, and three trade exchanges were sponsored individual events: Barter Consultants, BixXchange and New York Commerce Exchange. Bill Gross, CEO of Pimco (the world’s biggest bond investor), ranked 10th in Fortune magazine’s “The 25 Most Powerful People in Business,” says U.S. energy markets have reached a “tipping point” due to under-investment by energy companies in developing new supplies and a lack of investment in refining capacity. Furthermore, he says, the high energy costs will slow the economy...we will see a significant pullback in consumer spending next year. And if higher energy prices and rising interest rates aren’t enough, a presidential commission on tax reform is looking at the mortgage-interest deduction. (The mortgage-interest deduction saved homeowners $61.5 billion last year.) Changing the deduction tax benefits, even if done slowly, could cause short-term convulsions in the market as buyers recalculate what they can afford. With a rising federal budget deficit, the commission for tax reform says “everything is on the table.” Which would include the 1997 elimination of capital-gains for home sellers who profit...now $250,000 for individuals and $500,000 for couples. It was originally contemplated, by a nonpartisan budget group, that the capital-gains measure would cost the government $5.8 billion in lost revenue over 10 years. Instead it’s been 60 times that or $348 billion. One modification to be considered is the length of time one must live in the house to quality for the capital-gains exclusion, which is currently two years. In short, a lifestyle built on cheap energy costs and low mortgage rates (including home ownership tax benefits) is in jeopardy. One of the Wall Street’s best-known bankruptcy bankers is Bill Repko. He’s been associated with some of the country’s biggest corporate restructurings, i.e. Enron, WorldCom, United Airlines and Chrysler. In a sign that more companies could soon be facing hard times, Evercore Partners has hired Repko to bolster its corporate-restructuring practice. Bill Abrams, a partner in Washington (DC) law firm Abrams Garfinkel Margolis Bergson, puts together business financing...and they’ve seen a tenfold increase in home-equity deals since 2001. It seems that faith in ever-increasing property values has led to a growing number of entrepreneurs risking their homes to start or buy businesses. Abrams says they’re “betting the house,” because if the housing market softens many entrepreneurs will be left with huge debts and little equity. How tied-in are the relationships between the airlines and the credit card companies? At Delta, credit card sales accounted for $13.7 billion of its $15 billion revenue in 2004, according to a bankruptcy-court filing. American Express teamed up with Delta in 1995 to issue a credit card that sports the logos of both companies. The relationship was so critical that American Express last year helped the ailing airline, by prepaying $500 million toward its purchase of Delta’s frequent-flier rewards miles over a three-year period.